Intel is far and away the biggest PC chip maker, yet the company continues to struggle for relevance in the post PC world. However, recent rumors indicate that chipzilla will make the Apple A7 processor. 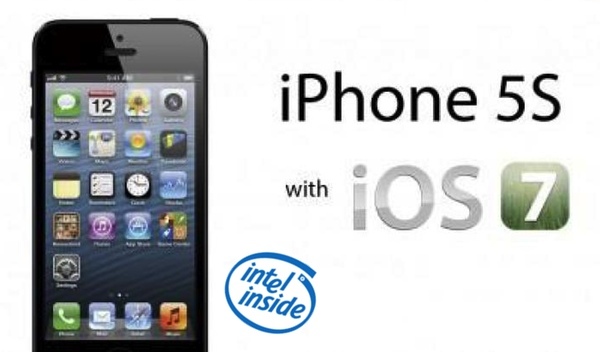 Could be, but are you ready for Intel inside the Apple iPhone? With the ongoing legal battles between Apple and Samsung, the mothership has been shifting procurement away from the Korean electronics giant. Displays, storage, RAM and processors, Apple is looking elsewhere for parts and transition has been underway for over a year. To date, the most difficult piece of the puzzle has been processors. Though Apple can’t yet fully break out of Samsung’s component manufacturing orbit, roughly half of the next-generation iPhone’s chips will be made by other companies. DigiTimes is reporting that three leading chip makers are competing to produce Apple’s A7 processor. Foundry service providers Taiwan Semiconductor Manufacturing Company [TSMC] and Samsung Electronics are reportedly competing for Apple’s A7 processor orders. Rumors regarding the possibility of Intel obtaining the orders have also spread. According to institutional investors, Intel may obtain 10 percent of Apple’s A7 processor orders. That said, it’s expected Samsung will supply 50 percent of Apple’s requirements with TSMC (40 percent) and Intel (10 percent) producing the rest. Plausible? With its PC business slackening, Intel reportedly has been seeking to bolster its share of the contract chip foundry business and Apple has figured prominently in those rumors.